Local MP Darren Chester will be wearing the number 1 race number in the Race the Rubeena Community Fun Run on February 24. But Mr Chester, pictured with skipper of the Rubeena Alan Lewis (left) and event organiser Gerard Callinan (right), admits the number is unlikely to give him a winning edge. 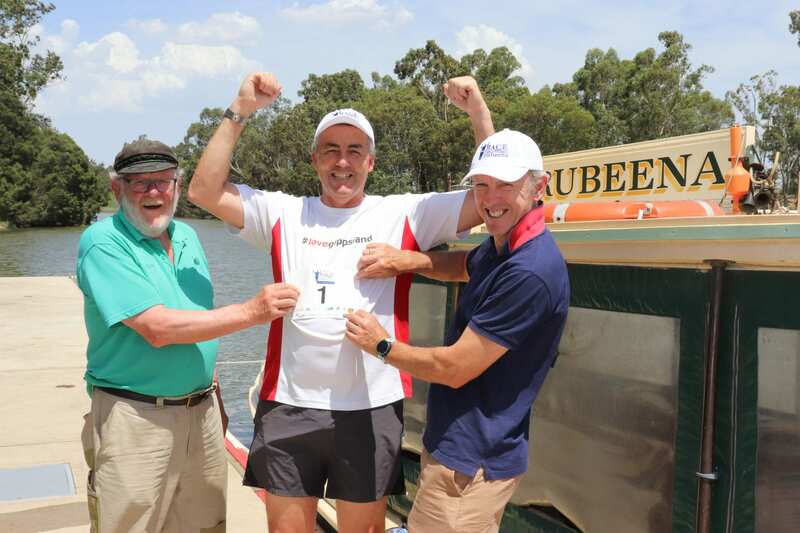 The Nationals Member for Gippsland Darren Chester has again challenged runners to race him in a five kilometre charity fun run in Sale. Mr Chester will donate $2 to Central Gippsland Health for each person who finishes ahead of him in the Race the Rubeena Community Fun Run on Sunday, February 24. “I had a very festive Christmas, perhaps a bit too festive, so I might struggle along the five kilometre course from the Swing Bridge to the Port of Sale,” Mr Chester said. “I think I might need to be prepared to write out a sizeable cheque to the Sale hospital. Event organisers hope to raise $10,000 to buy two cardiac crash carts for the hospital. The timed 10 kilometre run will start at 8am at the Port of Sale and follow the bike path to the Swing Bridge, before following the same route back to finish where it started. The five kilometre run or walk will begin at 9am at the Swing Bridge. Participants will have the chance to race against the historic wooden boat, the Rubeena, from the bridge to the finish line at the Port of Sale. Registration is now open for the event. Mr Chester has already registered and paid an additional $200 to wear the number 1 race number. People who want to take part in the fun run should register before the day at racetherubeena.com.au.